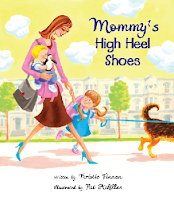 Mommy's High Heel shoes is one of those books that get you saying, "Awwww!" or "Wow" at every page. Awwww.... aren't these kids cute? Awwww.... isn't it fun to look for ladybugs and cupcakes and hearts on each page? Awwww.... aren't they a loving family? Wow.......... I just love how the modern story and retro illustrations work together so well! Wow...........doesn't that mom have some kickass shoes! Wow .......... look at all those yummy cupcakes (shall we go to Sprinkles now and get some for ourselves?)! The story is about a little girl who tries on her mommy's shoes after mommy has left for work; in the process, she thinks about all the different kinds of shoes that mommies wear. Kids will like it because it gives a fresh, funny look -- from a kids' point of view -- at what moms do at work. Since Mommy's High Heel Shoes looks at the literal and figurative shoes that moms have to put on, moms everywhere -- not just moms who work outside the home -- will find themselves breathing a silent Amen, sister! as they read the book to their kids. It's definitely a feel-good kind of book for both kids and moms -- as light and sweet as a cupcake. Here's a sweet deal: to get 15% discount off your order off the book's official website, just type in the coupon code SVMOMS. 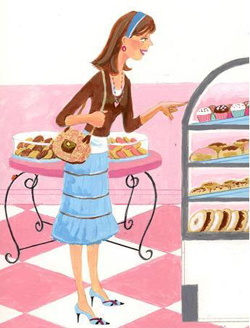 The icing on the cake: 50 cents from each Mommy's High Heel Shoes book purchased through their website will be donated to Kiva.org, a microlender that assists working moms and other entrepreneurs in developing countries. Now kick off your own heels, and enjoy this treat! Who won the Tooth Tunes Jr? Who won the Playskool Busy Balltivity Center? Win a Hollywood vacation from Leapfrog! Who won the Russ Seapal? Who won the I-Dog Clip? Let's get started on those Christmas cards! Who won the I-Dog Dance? Here's the Scoop.... Get out and Vote!! Tis the Season to Win Prizes!